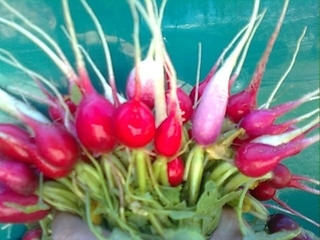 I grow my own variety of genetically diverse open pollinated land-race radish on my farm. I started growing my own radish seeds because commercial varieties were so unreliable in my garden. I select for plants that produce edible roots early, that are slow to bolt, and that don't crack. To maintain genetic diversity I also select for unusual shapes and colors of leaves or roots. The selected plants must thrive in my arid sun-drenched high-altitude garden and limestone derived lake-bottom soil.